Aster is available in various varieties. They are part of the sunflower family and are also known as “frost flowers.” Their leaves are green and several color options are available on their petals, such as: white, lavender, and purple. 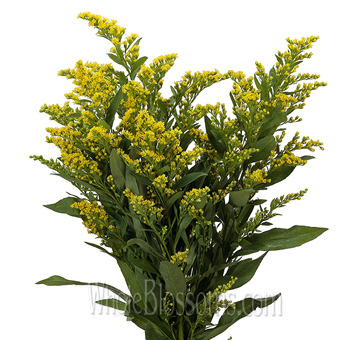 Solidago, which is yellow filler, is also used in garden-style floral designs. Monte Casino Aster and Heath Aster are both very similar to Daisy Flowers in appearance and come in shades of white and lavender-purple. They are symbolic of good luck, patience, and love. Asters are known to be daisy-like, yellow and centered dainty flowers. They are popular during fall as they choose to bloom at the time when all the petals of other flowers shed. Aster comes in an elegant range of colors from various shades of pink, red, white, and even darker shades of blue, red, etc. These starry-shaped flowers stand to be a significant part of garden flowers. They are also called Frost Flowers, Start works and even Michaelmas Daisies. Asters are appreciated due to their delightful colors which can bring an enormous amount of joy to anyone. The flower has many different species and varieties. The flower plant's height can differ from eight feet to eight inches. This mainly depends on the type of the flower. The frost flowers have grown as wildflowers since ages. The word Aster is derived from a Greek word, and it essentially means Starlike flowers, it refers to the star-shaped flowers. In ancient times, the leaves of aster were used to ward off evil. If we take a stroll down the road of Greek mythology, the goddess Astraea was supposedly asked to be turned into a star. This was when the God Jupiter flooded the earth. The flowers henceforth were named as Astrea which resulted from her tears as she wept for the earth. The beautiful flower inevitably carries along its legendary history. The colorful history of the flower still manages to surprise many, and it comes with daring legends. Asters are still known to be sacred to gods and are often used in wreaths. Every species of aster symbolizes patience and elegance. The flower continues to be the center of the attraction in any place of floral arrangement. Aster is considered as the flower of September. The flowers bloom mostly towards the end of September. During the fall season, they amplify the vibrancy of the surrounding with their presence. They are known to impart a happy atmosphere and hence, are known as the superstars of the garden. 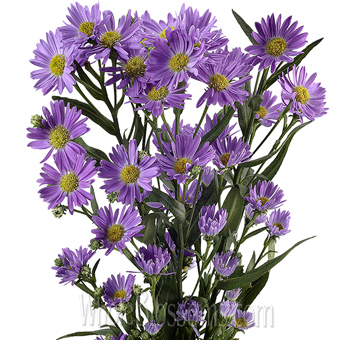 You can get Aster Flowers for sale easily through trusted online floral shops. These flowers are a part of the sunflower family, and they also resemble a lot to daisies. The vase life of asters can range from five days to fourteen days with special care. The diverse colors of the aster flowers speak volume of their alluring beauty. 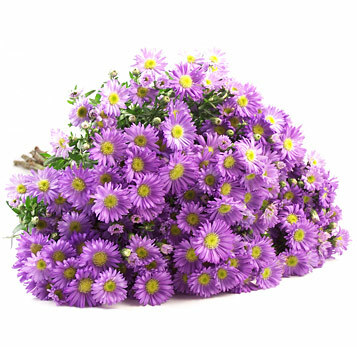 Purple-colored asters stand to be the best choice for bridal bouquets. These flowers can be small, bright, and beautiful all at the same time. It can form a tiny mound like structure which adds to its defining beauty. They add a tinge of a refreshing and beautifying element to the whole floral arrangement. These flowers can be made into great assemblies with some white colored asters. There are many species of the flower-like Aromatic aster and New England aster which grow on roadsides; they are yet to be recognized as asters! They carry the name of aster as a common name. The wild aster residing in the USA is known as the alpine aster. With long petals, fellowship aster manages to shine brightly with its divine and elegant look. These flowers come in white, red, lavender, blue, and even pink colors with yellow centers. Mostly, blue/white/purple Aster flowers can be commonly bought through online floral stores. The many colors also range from pastel blues and hybrid variety of deep scarlet and purples. The aster flowers are very complicated in nature. They are basically a collection of small tubular flowers which are then grouped together within the central disk. The whole group is then surrounded by ray flowers or petals. The calming and soothing effect of the flower can sway anyone. 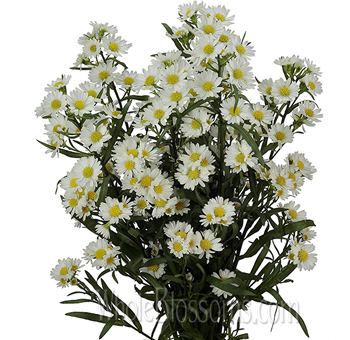 White asters come to be an excellent choice for brides. Red asters are preferred as gifts for loved ones to share the happiness around. Where to buy Aster Flowers online with the best quality? Get fully assembled Aster flowers right at your doorstep from trusted online floral shops. There are many reliable florists who offer fresh and quality flowers, Whole Blossoms is one of the ideal choices. Start mapping out some indulging decorative ideas to fix the flowers in the best setting. There is a ton of choices with Aster flowers for sale at Whole Blossoms. Put your trust in online florists to provide you with dazzling aster flowers to bless your surroundings. Get your hands on the best quality of freshly cut flowers by a bulk purchase of flowers offered by online outlets. The divine nature of Aster flowers makes it the perfect with wedding gowns. The flower stands to symbolize love, good luck, patience as well as peace with the enchanting effect that it has.